My last post mentioned outreach in the community which led to discussions on Twitter from community groups themselves, and the cultural sector, including an insightful comment by Ian Jenkinson. Like all relationships, these things take time. Some advocates already exist (Friends, Volunteers) while other relationships need to be built up. Encourage visitors to become advocates by ensuring social media and contact information is visible around the museum. People love to ‘check-in’ on Facebook and FourSquare and Tweet what they are finding. Ensure front of house staff/volunteers know your social media names/spelling. Create blogger events. It’s a bit cliché for some of the national museums yet it is something that local museums haven’t always embraced. You can ask the mother and toddler group that meets in your café to join special baby friendly previews. Or contact the people on Facebook and Social Media that always talk about you (not the ones that always have the most followers either) to press previews. On the same lines, you can share up and coming exhibitions and events to the advocates and encourage them to discuss it on and offline. Allow the Friends group to blog If they don’t know how to, you do it for them. Interview some of the Friends and ask them what makes the museum/art gallery important. 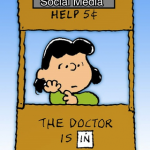 Or even better, offer to host a Social Media Surgery (with the volunteers). Ask the Volunteers to share why they are passionate about the museum. Allow them to share their stories on the website and on social media. Invite Foodies in to write about the cake, er, café. As suggested before, Community Outreach could lead to an advocacy. There are many local groups that will target non-traditional visitors. What do I mean by non-traditional visitors? Those visitors that for whatever reason, feel museums are not for them. These could be the group that see museums as posh people zones. By inviting community groups to use your space not only can they become your advocates, but they can become advocates for the sector. Open you data! 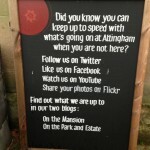 Want to really get your venue talked about online? 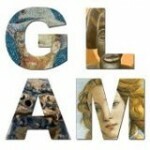 Open your data to Galleries, Libraries, Archives, Museums & Wikimedia (GLAMWiki) or host hackathons. Not sure how to go about this? Ask! There are lots of people who would come in for free or a small fee to digitize your data – you just have to open the data up. Don’t burden them with the institutions problems. Council cuts, foot-flow and staffing issues are not the advocate’s problems. Do not assume everyone who tweets or likes you on Facebook is an advocate. Take the time to listen to your social media person on this judgement call. Do speak to everyone on your teams. Advocates can come from many different areas. Do empower your advocates. Let them decide what is exciting and share-worthy. This is just a small selection of ‘Where to Start.’ What made you become an advocate? What events/activities would you suggest to get advocates involved with your museum/gallery? It would be great to hear from different countries too.